Sionne Elise and Maggie Jorgenson were eating pasta in the Covel Commons dining hall when they came up with the idea for their independent short film. 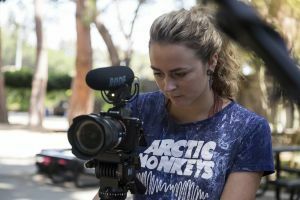 This year, the fourth-year theater, film and television students will release their film “Going Solo,” a story about two lesbian teenagers who must navigate high school while dealing with issues such as independence and anxiety. After Elise wrote the script in fall 2016, she and her crew worked with a limited budget of only $400 toward the film’s release in late July. Elise originally pitched the film to UCLA Delta Kappa Alpha, the university’s co-ed professional cinema fraternity. But when the fraternity rejected the film, Elise and four other fraternity members decided to work on the film independently, using cost-effective measures to keep the film under budget. Elise wrote the short film based on her and Jorgenson’s own experiences with anxiety and the LGBTQ community. She said she decided to focus less on the characters’ lesbian relationship in the script and more on the characters’ individuality, in order to normalize being gay in high school and to create female characters that are more dynamic than other female roles she has seen in the media. In order to start producing the film, the team fundraised using the crowdfunding website GoFundMe.com with a goal of $415. While they did not meet their goal before they started filming, by the time they finished filming they had raised $470. 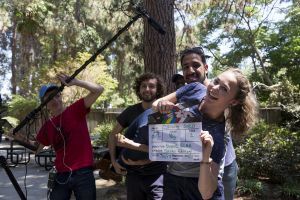 The film’s producer, third-year political science student Jaie Peshawaria, organized the filming schedule so the crew could shoot out of sequence and save time and money on transportation, he said. He also reached out to Chipotle Mexican Grill and Subway, which catered the production for free. Along with finding deals and student discounts, Peshawaria also saved money by asking members of the cast and crew to offer the use of their belongings, such as clothing, posters, vinyl records and a drum set as props, or set dressing, lights and camera equipment for shooting. “It speaks to the creativity of UCLA to be able to use what everyone has, and that’s part of why our budget is so small,” Elise said. 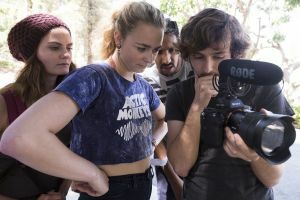 The actors’ focus and Peshawaria’s foresight also helped save time while filming, said Brian Cesson, the film’s cinematographer and a second-year film student. Peshawaria sent crew members to each location early so that by the time the actors arrived, the team was ready to shoot. Another way the team avoided additional costs was by filming in public places that did not require a permit or insurance to shoot, Peshawaria said. The team only needed one permit to film at Peet’s Coffee & Tea, otherwise filming in public spaces, such as outside Sunset Canyon Recreation Center and behind Melnitz Hall. To make the film appear as if it was shot at a high school instead of locations around campus and in Westwood, the team used close-ups and medium shots to focus on the characters’ performances rather than the setting, Peshawaria said. While preparing the scenes for filming, each member of the crew had multiple tasks outside of their traditional job descriptions, Cesson said. For example, actors contributed by helping move camera equipment to different locations. The cost-effective collaboration among the small crew grew as filming went on until even the directing became a joint effort by Elise, Cesson and Peshawaria. While Elise still made the final decisions, Cesson said he and Peshawaria focused more on camera angles and framing to make sure each shot would fit into Elise’s vision. Elise said she also directed the actors and acted herself. Almost every shot was a collaboration, and they compromised whenever they disagreed, Elise said. In one case, Elise preferred to film the characters walking and talking while Cesson favored filming them standing still. In the end they filmed the actresses walking, and Elise said she trusted Cesson to make it work. Cesson also collaborated with other members on the film’s sound by setting up microphones and teaching other crew members how to do so as well. Cesson said he believes people on set taking on multiple roles contributed to the high morale of the crew. Sionne Elise, director, writer and actor in “Going Solo,” said she noticed the media tends to create distinctions between being a woman and being gay, and that she wrote the characters of Mia and Tyler to show the dichotomy is a false one. “I’m showing that this girl – this woman – can still have these traits of being a woman and a girl and independent and trying to figure herself out, while she’s also gay and dealing with mental health issues,” she said. The production team holds up fourth-year theater, film and television student Elise between takes. 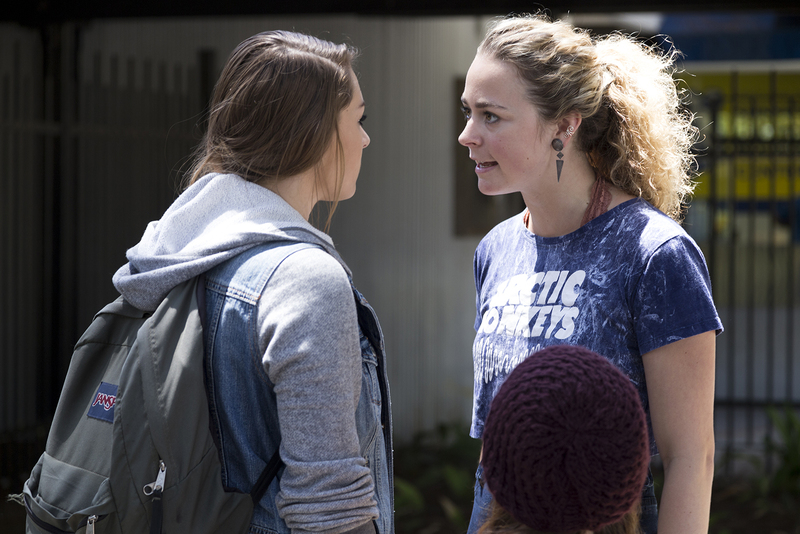 Elise and fourth-year theater student Maggie Jorgenson, who play Tyler and Mia respectively, collaborated closely while editing the script. Jorgenson’s own struggles with anxiety are reflected in Mia’s panic attacks in the film. 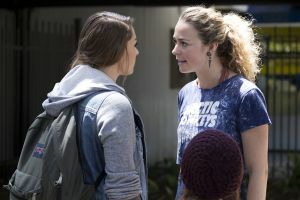 Jorgenson wanted the film to show a character who is queer and anxious but not suicidal or homicidal as many characters with mental issues in the media are, she said. “What’s important for me with both having anxiety and finding myself in the LGBTQ community is putting that image forward ... that you can have these two things and you can figure it out,” she said.